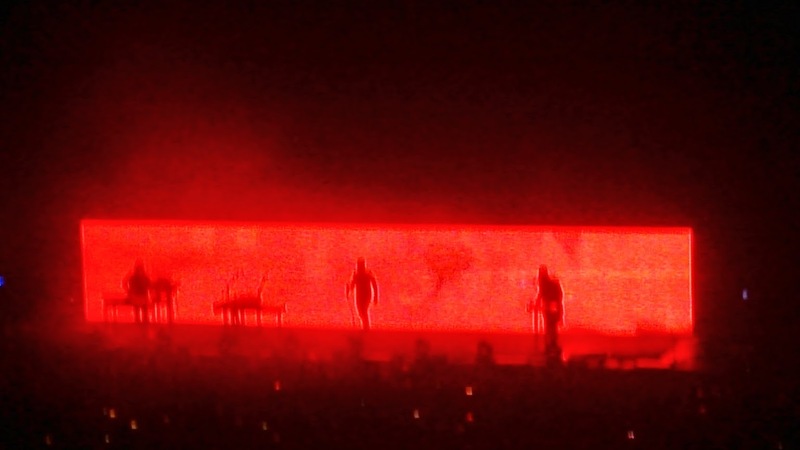 On Wednesday I went to see Nine Inch Nails in Cardiff and I have to say it was the most amazing show I’ve seen in a long time. The light show was fantastic and the set list included their best hits including “Head Like A Hole”, “Closer”, “The Hand That Feeds” and “Hurt”. Me and Kiki decided on Balcony seats which was a blessing actually as not only did we have seats, but we also had a full view of the stage, our own bar and toilets, and no annoying people bumping into us and generally being a pain in the arse. It was all very civilized. Haha. The support act (Cold Cave) were new to me and during the first 2 songs I found them quite interesting (Sort of like Depeche Mode or The Cure) but it soon grew very boring and looking down at the almost motionless crowd I could tell everyone else thought the same. Me and Kiki remarked on what a shame it was that ‘Soundgarden’ were only supporting on the American leg of the tour. I would have loved to have seen them. When Nine Inch Nails finally came on the atmosphere was on fire. Trent has so much energy and certainly knew how to work the crowd. Even high up on our little balcony you could get a sense of his stage presence. If you get a chance to see NIN I highly recommend it, as even if you are not a huge fan the whole thing was just electric.